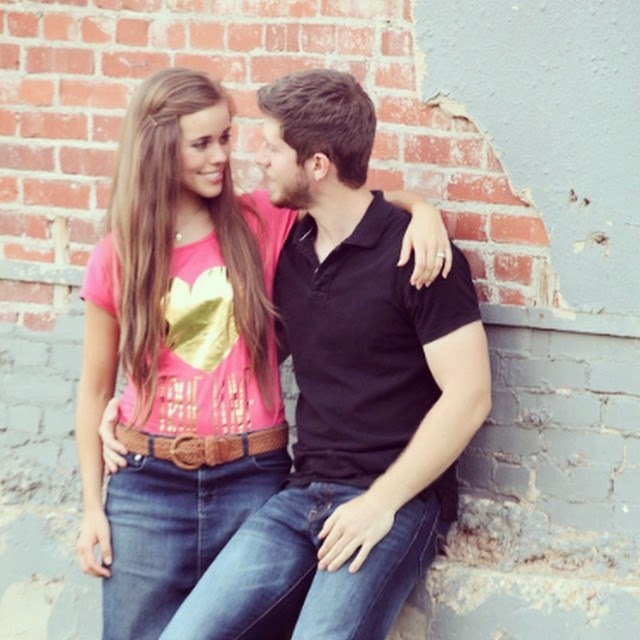 Jessa Duggar and Ben Seewald are in the thick of wedding planning. Their guest list is complete, and the couple drove to Bed, Bath, and Beyond yesterday to finish their gift registry. "The guest list is pretty big, but not as big as my sister's," Jessa Duggar told ABC News. "My list is a little smaller [than Jill's was], but then Ben’s guest list is bigger Derick's. It will be another Duggar-sized wedding!" Jill (Duggar) and Derick Dillard invited approximately 3,000 guests to their wedding and ended up with a crowd of around 1,500. Jessa is following in the footsteps of her siblings Josh and Jill, who tied the knot before her, by saving her first kiss for the altar. "We’re really looking forward to the first kiss!" Jessa ABC News. "We're talking about it -- what if we miss or mess up? We're gonna have to plan this out or something!" Jessa and Ben plan to reuse Jill and Derick's decorations and flower girl dresses, as they hope to keep their wedding as cost-effective as possible so they can splurge on their honeymoon. "We’re gonna go really simple with a lot of our food and even flowers and that type of stuff," Jessa told ABC News. "People spend so much on flowers, it’s outrageous! I'll go to the grocery and buy flowers! I don’t know how many flowers we'll have in nature if it's cold outside but I was like, 'How about we just go pick [some]?'" The couple has chosen a wedding date but has not announced it to the public. They have hinted that it will be sometime this fall or winter. The wedding and part of the honeymoon will air on TLC's 19 Kids and Counting. Two Weddings in one year perhaps? the Duggars have a lot this year! two weddings and a baby on the way. I just hope they wait a little before having a baby of their own. If you think about it, that's a pretty disturbing comment to make. You shouldn't be thinking about what they do with intimacy. Creepy. Why should they wait? Their courtship and engagement are way longer than Jill and Derick's!!! Wish I could come..im one of ur biggest fans watch ur show every day congratulations ben and jessa. Congratulations to Jessa and Ben! Congratulations to Ben and Jessa on their announcement of their future wedding! A fall wedding should be a beautiful time of year and November 1st is a great day to get married. We wish them both many years of wonderful memories together. Yay!!! This is so exciting. Cant wait for the wedding. Im guessing it will be sometime in December or January. Jill went with the sea foam green and the peachy colors, so I wonder what color(s) Jessa will choose. Has anyone heard how Jill is doing with twins on the way? Where did you hear she was having twins? Are you able to confirm the date that Ben and Jessa are getting married on? Thanks so much. :-) I'm so excited for them and to see it on the show. They can do what they want. But why does very member of the family need to stand up? Get a few boxes of flowers from Costco. Follow the directions. Not every person needs to carry flowers or wear flowers. If they only invited family and extended family and don't go beyond that by much they actually may be able to speak to people at the wedding. When the guest list is huge, what is the point? aww I think it would look very cute if they go pick wild flowers! I read somewhere that Jessa and Ben choose November 1st for their wedding date. I read their wedding was planned for November 1st. I believe it was on the gift registry :) Either way Conrats to the Happy Couple! Seriously- love the duggars ! - that middle pic, though, is ridiculous. I read on several sites that they've set the wedding for November 1st? I thought the wedding date is November 1,2014? I really hope jessa is happy. I like how Jessa said we gotta plan this out or something, referring to their first kiss. Maybe she is hinting to Ben, she would like to practice Before the wedding..lol. Still get the feeling maybe they have already shared a peck or two while the young chaperones were enjoying a piece of candy. I thought they had already set a date for the wedding, November 1st? Nice to see the focus is on the future and not the wedding. The flower girls wore summer dresses so I sure hope they add a muff or cape of some sort to stay warm if the wedding is sooner then later. McCall's had a precious pattern for a velveteen cape lined in satin we have used in the past. Little black Patin leather shoes would be adorable too. It would be neat if Jessa considered having a dried bouquet she could keep forever. You can buy lesser quality flowers that way on clearance and dry them after you arrange. I am sure it will be lovely. I read somewhere the date is November 1. Any truth to that? Can't wait to see Jill ' s wedding and Jessa's wedding. So happy for both of them. Best wishes for a healthy and happy life together to both couples. Exciting! Can't wait til the wedding airs! Do you really even know 3000 people? Seriously don't want to waste money on food for the guests, but want expensive gifts from bed bath & beyong. what happend to humbleness? Getting a meal is a bit different than getting things that set you up for life. I think most people go to weddings because they want to celebrate the love between the couple- not to get a meal. A way to celebrate and affirm ones love for the couple is by giving them something to help them get started on this new journey. I hope the best for the wedding. I wonder what Jessa's dress will look like? More like Jill's or more like Anna's? I had originally planned a September wedding because myself and my maid of honour have seasonal hay fever. When the date was changed to June, I did some research. Instead of flowers, the bride could carry a prayer book or a small Bible, with a Satin cover. My maid of honour carried a cute heart shaped pillow with a bow that had a long tie so it looked like streamers cascading down. It matched one of my wedding colours. We carefully made a tape loop to stick the rings on the pillow. Since some people claim the Duggars are anti-military, and Veteran's Day is the major holiday in November, perhaps something as a tribute to the military would be nice? why do you always use the same pictures? I wanna see different ones!! Excited for Jessa and Ben! Congrats to Jessa and Ben, can't wait to hear more details !!! I hope we don't have two of our daughters getting married in one year! lol You can do flowers cheaply but they should be something more than from the grocery shop. Might not be that fresh. Can you go wholesale and buy straight from the grower in America? I got my fresh flowers fior my wedding straight from the farm and put them together myself. Wedding bouquets are not hard to do. With the amount of help the duggers have they should be able put together some lovely bouquets. I dont recall seeing any food besides sweets at Jills wedding.The Bates girls had a variety of sandwiches.I just think that all the time and money that the guests give, they deserve some food besides sweets.Now i could be wrong about Jills reception food,but thats what i remember reading. Mid afternoon receptions don't need heavy food served. A guest is never obligated to attend a wedding, and they are always aware of what to expect food wise when they receive the invitation. wow I looked at the registry-they registered for 7 Full/Queen comforters/quilts!!!!! A fan page on Facebook announced it was November 1st, but I don't believe it. Just because some gift registry said it was, doesn't make it true. Lots of people create fake gift registries. We'll know in due time. MAY YOU ALL BE BLESSED AND HAVE A WONDERFUL WEDDING ENJOY AND LOVE ONE ANOTHER GOD IS SO GOOD!!!! The wedding is on November 1. It says so on the registry. What are Jinger and Joy doing these days? I spent the last couple of days in bed watching the rerun of the show. I just finished my last kemo treatment. The love of this family is truly Amazing. I have 13 and 15 year old boys and they are great boys. The Duggan family is my hero you brought a light to my dark days for the last couple of day. Bless you guys. Too bad to see the Duggar girl's skirts getting tighter and shorter. What happened to being modest? They are looking more and more like the world all the time. How they choose to dress does not in any way reflect how good a Christian they are.People change as they mature and make their own decisions for themselves, thats life. I want to wish this young couple all the best for their future. I do wish that everyone would stop stating the ages of Jessa and Ben. He isn't twenty yet and she passed that age a couple of years ago so to some people it looks like she is robbing the cradle. My husband was not quite 3 years younger when we got married and we will celebrate 44 years together this September. He seems very mature for his age. I am more for older guys but they are cute together. In a few years the age difference will not matter anymore. I hope they are happy; I hope god will bless and watch over them and help them suceed in marrage. I think ben will make a good husband to jessa and father in the future. Once more I wish them good luck and a long life together. It would be cool if this site had a contest for a fan to attend the wedding. The Duggars are millionaires so it upset me that they had a truck set up for guests to donate cash to the Dillards at their wedding. Many fans and guests are struggling financially and don't realize they are millionaires. Yes I agree with Jessa being 2 years older, this is no big deal. Once you are adults, age doesn't matter so much,especially only a few years difference. Age is only a number. People can't change that. My friend's mom is 3 years older than her dad and they have been married 37 years. When it works, it works. There are more important elements in a relationship to consider compared to the year each was born. I say if you love each other, it will conquer all. Does anyone else think Jessa looks a lot like Joy in the 2nd picture? @Libby Waters@ Libby---her dress will be either Anna's or Jill's! While I don't agree with the duggars (or what they register for) November is a great month for a wedding! I got married nov. 4 (8 years ago!!) I wish I could get some of their money... Or gifts. We never had a honeymoon, really jealous that God blesses them in every way. i am so happy for jill and derick and jessa and ben. i have been watching your show for many many year. congrats to jill and derick for baby on the way. will you guys be like your mom and dad and josh and anna and have your kids with the same first initial, you guys are awesome. That comment about why don't we just pick wild flowers! I said something like that about our wedding. I also saw how everyone seemed to think everyone else had a right to invite all the people they thought should come, and I was just like, we should have just announced it after a service that we're getting married and anyone who wants to stay can. Then our attendants and we could file in and that would be that. It would keep the reception a little more uncomplicated too. Just all the close family and friends knowing in advance so they could plan on being there, but not too much advance. Anyway, it didn't happen that way. If I went back in time I might do it that way. We actually ended up using flowers from a greenhouse my sister worked at at the time. I think they were either really cheap or free. Auction sale returns that hadn't sold. The bridesmaids and myself carried other ones that were bought. And a friend of my parents did the photos. I think he did a fabulous job. And free. I wouldn't have even thought to know what poses and all the rest, to do. It's not something I think about much. But my bouquet is in the photos. So though I didn't save it or remember what it was like, I can look at the photos if I ever want to remember. Yeah I don't see why Jessa would have to get or pick free flowers or reuse Jill's. Jim Bob just purchased a liitle less than a half a million dollar plane for JD. If he could afford to splurge such a large sum of money on one kid's dream, why can't Jessa at least have new wedding decor? Age has nothing to do with success in marriage, it is where you are at in life & your goals together. My brother in law is 7 years younger then his wife. They met at work, share the same values & goals & have been happily married for 14 years. I think any issues with Ben & Jessa I see have nothing to do with 2 years age difference, it is life experience. Jessa finished school at 16, so she is almost 6 years out of school. Ben finished last June so he is 1 year out of high school/home school. It is those 5 years of life experience at this young age that might make a difference. What they obviously have as a positive is the same beliefs & ideas about family so I can see it working out fine. I hope that Jessa and ben dont move in that horrid guest house on Jim Bobs property after the wedding- it seemed to me that Ben should not have agreed to move in there because it seemed like an attempt to keep them there after the marriage with Ben working for Jim Bob, because the Duggar sons have become busy with other things and want to pass the work on to poor Ben. I hope that Jessa will plan a beautiful wedding and that wedding fatigue from Jill's wedding won't set in. Jessa is not as big an organizer of people as Jill is, but I hope she gets everyone to make hers as nice as Jill's. Congrats y'all!! Praying for you. I love this family, I love what you represent to the youth of today and that the Lord is first in everything. I am a huge fan, bless all of you and congrats to Ben and Jessa and Derrick and Jill and the new little Dillard on the way. So happy for you all. congratulations to Ben and Jessa! you guys make a cute couple and i wish you the best! thankful for setting a godlt example of vourtship and marriage and showing the world it can be done. i am very dissapointed in jessa's dress lately the dress she wore in some of her engagement pics was both sleeveless and above the knees both things the Duggars said point blank they dont do and in these pics her skirt is very tight and once again above her knees. Maybe there is some truth to what you say and maybe Michelle also wants to keep Jessa closer by because as they all grow up and move away, there's less adults to help out with the smaller children. I just would like to see Jessa and Ben NOT start a family right away and live their own lives doing something other than getting pregnant and having babies. Jessa is so smart, I hope she puts off the typical tradition of babymaking. Jessa may be a little brainwashed and a little misguided but that girl is smart as a whip! Get 'em, Jessa! I appreciate the family's commitment to courting as the first step to marriage. What I find a bit disturbing, IMPO, is this mandate their first kiss at their wedding. I find it embarrassing for them that they have to share this first special moment with hundreds of guest and millions of tv viewers. This is a sweet, private moment of their relationship and should be a private moment for just the two of them, not something that needs audience participation. Big Congrats to both of you.